Desperation had set in. I had to catch a fish. What with visiting the family, trying to sell the house, doing the garden and going on holiday the fishing has been 'on the back burner' for a while. 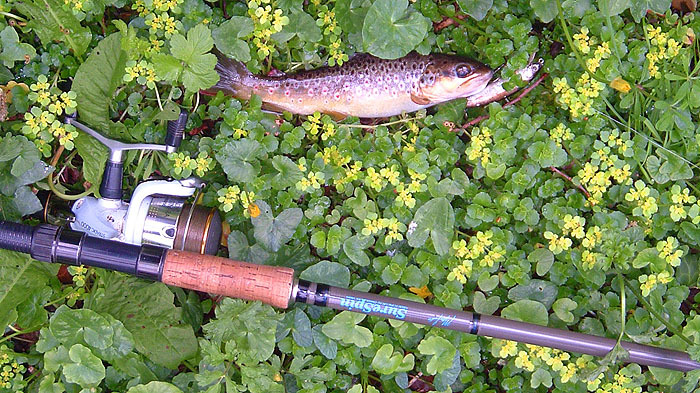 The estate agent had arranged to show someone round the house yesterday morning so I picked up the rod and the bag and went for an hour's trout fishing. Now I know that there will be people who don't want to read the next bit so skip this paragraph if you are a died in the wool chalk stream fly fisherman. The rod I picked up was my bass spinning rod with thirty pound braid and a fifteen pound nylon trace. 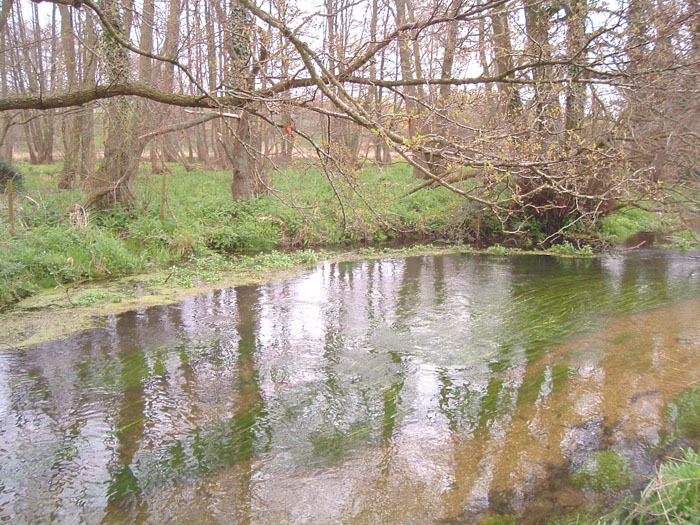 After a chat with the farmer who owns the land surrounding the stream I walked across the field to the water's edge. I rooted in the bag for a suitable lure. Most of the lures in my bag are big ones intended for bass or pike. I was on the verge of attaching an 11 cm bass plug when I found a small ABU Terminator that looked more or less like a fat minnow. I looped it onto the trace and had a trial cast. The lure was quite heavy and went out like a bullet - making a loud smack and a splash as it hit the water - not ideal. 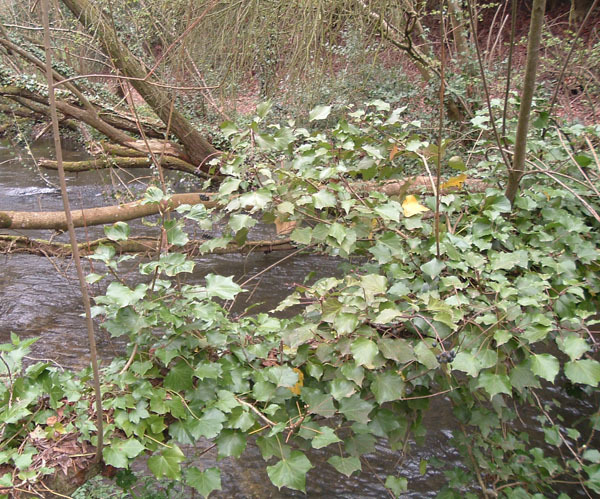 Anyway, I found that by feathering the line at the end of the cast it was possible to hurl the lure, in a flat trajectory, under the overhanging branches and let it splashdown with only a modest plop. The plug only just floated so as an alternative, if casting was impossible, I could lower it in and drift it down to suitable spots. 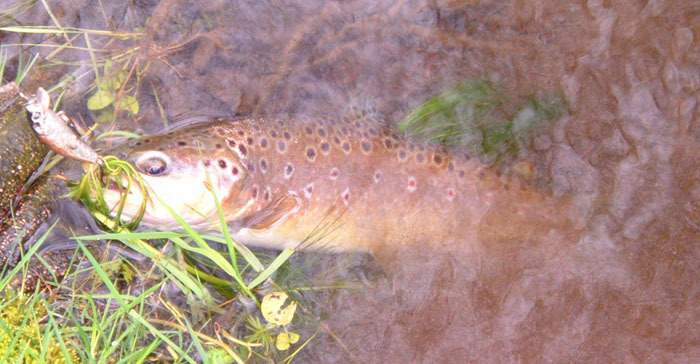 The first few casts into a deep pool were fruitless so I moved on upstream and flicked the plug up into a riffle. Wallop! 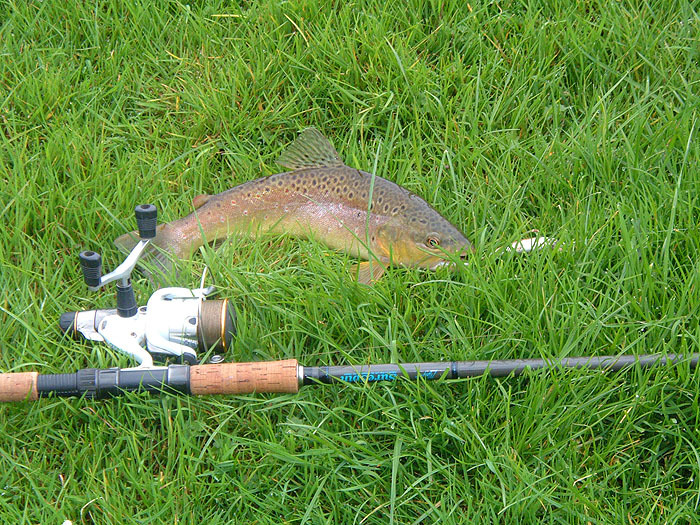 A decent trout was on and I soon landed and returned it. As you might imagine the fish was no match for the tackle - in other words it had no chance of escaping. However, I had the clutch set more or less as I would for four-pound nylon so, as far as I was concerned, the battle was identical. Anyway, who wants the fish to 'have a chance' if this simply means escaping with a hook stuck in its mouth? Of course in years gone by there was good reason to use finer lines etc. in order to enable precise casting and delicate/appropriate presentation of lures but with modern rods and reels and braided line this is no longer necessary. I tend to use exactly the same gear for nearly all my lure fishing these days and I've not noticed any deterioration in catches. So, when that surprise twenty pound seatrout grabs the lure I shan't be worrying about being broken. Anyway I pressed on upstream and caught another four fish, three by casting upstream and the other (the biggest at over one-and-a-half pounds) by drifting the lure downstream. 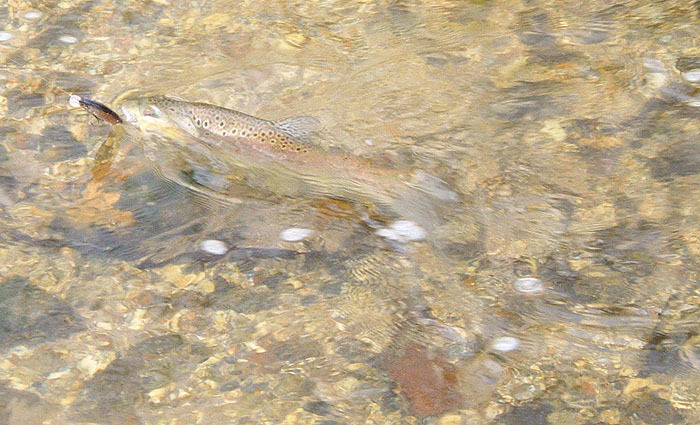 I then walked on down to a heavily wooded section and landed two more trout before going home. All the fish were lip hooked and went back in mint condition. Clearly the 'crude' gear did not put them off in any way. I have to say that the more I fish the more I wonder whether much of the traditional wisdom regarding 'tackle shyness' is simply hearsay and wishful thinking.